WTI crude prices are in the $43.50-$43.75/b range this morning. 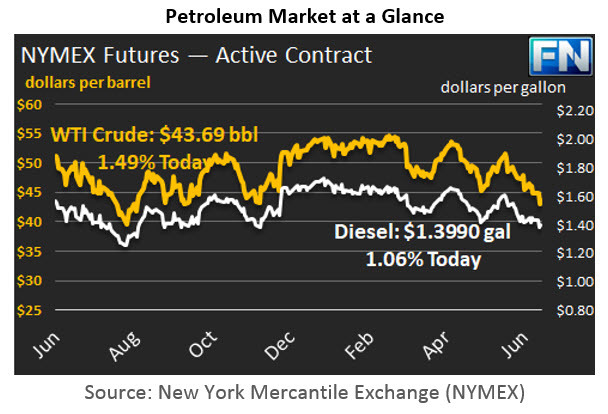 Prices continued to decline yesterday, closing at $43.23/b. WTI opened at $43.38/b today, a drop of $0.73, or 1.65%, below yesterday’s opening price. Current prices are $43.69/b, up by $0.18 from yesterday’s closing price. WTI prices dipped as low as $42.75/b yesterday, a low not seen since last August, before climbing back above $43/b. Diesel opened at $1.3914/gallon this morning. This was a decrease of 1.73 cents (1.23%) below yesterday’s opening price. Current prices are $1.3990/gallon, up by 0.41 cents from yesterday’s closing price. Gasoline opened at $1.4228/gallon today, a drop of 2.58 cents, or 1.78%, from yesterday’s opening. Prices are $1.4329/gallon currently, up by 0.89 cents from yesterday’s close. The issue of crude and product inventories is at the forefront of the news today. The American Petroleum Institute (API) reportedly noted a 2.72-mmbbl drop in crude inventories last week, above industry expectations of a 1.5 mmbbl drawdown. However, the API’s data on product inventories differed greatly from industry expectations. The API reported a gasoline stock build of 0.346 mmbbls, while the industry survey had anticipated a drawdown of 1.0 mmbbls. The API also reported a distillate stock build of 1.84 mmbbls, more than double the industry survey of 0.75 mmbbls. The API numbers were bearish for futures prices, and buying interest is muted pending the release of the official weekly supply and demand data from the Energy Information Administration (EIA) later today. Global inventories also remain at unwieldy levels. Bloomberg reported that oil in floating storage hit a new record-high for the year, at 111.9 million barrels. Most of this in stored in tankers in the North Sea, Singapore, and Iran. The presence of such hefty stockpiles around the world is a key reason for the current price weakness. A key goal of the OPEC-NOPEC production cuts is to begin draining inventories, but the process is a long one, and many analysts believe that the OPEC-NOPEC cuts will not be sufficient. Previous ArticleShould Your Company Move towards Green Fleets?